Chanel No. 5 Perfume commercial directed by Jean Pierre Jeunet (Amelie) takes the Orient Express as its setting. Audrey Tauto gets on the train in Paris, follows a scenic and flirtatious journey towards Istanbul and gets off the train at one of the most beautiful train stations in the world, Haydarpaşa. 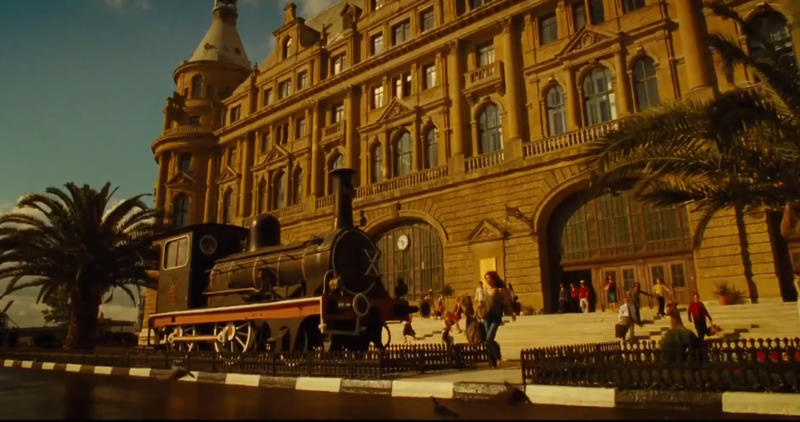 Well, if we manage to put aside the highly orientalist representation of Istanbul, another detail strikes the viewers: Haydarpaşa Train Station is actually on the Asian side. Since the Orient Express cannot cross over the Bosporus, the actress should have gotten off the train at another station: Sirkeci. For the obvious beauty of Haydarpaşa, we can forgive such a big mistake. However, there is another fact about the train station, which is hard to forget: Haydarpaşa was set on fire on November 28, 2010 and since then it hasn’t been renovated. The station was sealed off for transportation on June 2013. The government is dreaming to privatize the station (a historical monument), turn it into a luxurious hotel and transform the area with a speculative real-estate project development. The story beneath the surface is not as romantic as the director Jeunet tries to portray. The struggle to save Haydarpaşa continues as of today!